Help spread the word and let people know where our new home is. Take a moment and let us know your former name if it is different here. I just purchased a 1995 Regal 272 and if anyone has any insights into this class of Regal I would welcome your comments or suggestions. what ever happenend to the regal owners web site? Sorry DogDaze, I did not mean to be so prophetic. I thought the Indians were finally going to win it! Well, there is always next year. And OBTW, don't send Coach after me, I am sure he is not happy after the latest RedWings/Shark outcome either. Yes, Port Clinton is about 70 miles west of us, but is in the heart of the Lake Erie Island area... 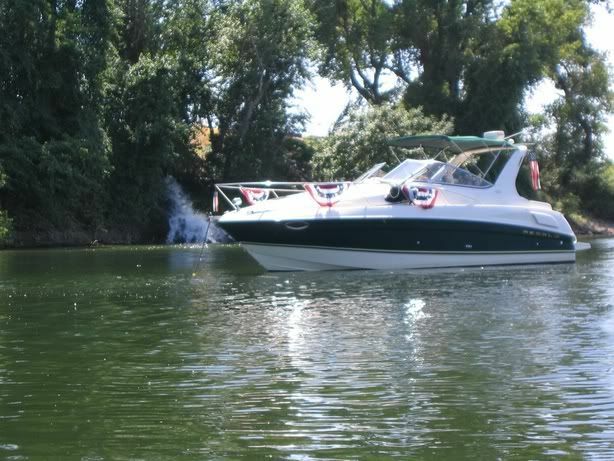 I'm glad you were able to find a boat here you liked and able to ship it back.. we just got back from Buffalo yesterday looking at a very nice 322... what a beautiful area.. if we get this boat, we would be lucky enough to get to bring it home by water.. as opposed to having it hauled back. It would be a nice trip... now all we need to do is to get our 280 sold first.. I see that you talk about anchoring, that you can send in twenty dollars to help support the site where can I send the donation ,what address, Kirsh, same name ,new place ,glad to be back. There is a sale going on, only $19.95 this week! Dogdaze ,I see your from Bay Village Ohio , bought my Regal 3860 in Port Clinton had it shipped to Red Bank, NJ what a trip that was. DogDaze, don't jinx me with Coach, I'm trying to get on his good side, so that I can sip from the cup when he wins it this year! Coach - you might want to think about contacting a boat shipper and have the boat shipped to Southern California that way you could use it all winter. And I am sure it would be a great stress relief when you have one of those tough games. From what I hear it is pretty reasonable. I have the I/O, which is really great for performance, but if you are in saltwater all the time, the inboards could be a better option. No wonder we did not hear from you, you were on the boat the whole time! CoachRW, glad you got to enjoy your summer on the boat.. I have inboards. Didn't take but 10 minutes to get the hang of it. I put about 20 hrs. on the new boat, and over 130 on the 3360 (all of that in about 2 1/2 months of boating). I'm going through withdrawal now being on the other coast; I have lots of pictures/videos to help me get over not being on the boat everyday. This forum helps for sure, as well. Couldn't Join this Summer-having too much fun on the water! This was the craziest thing-losing your regal website. And I thought we just drank too much out on the hook all summer. Cheers from Beautiful Sandpoint, Idaho! PS: Does anyone know Tom from Tom's Boat Shop in Wilbur, WA? Just met him and seems like a standup guy? just rub some more salt in that wound, you could have at least sweetened it with a Margarita! Well, since we are out, I will actually root for the Tribe now, but that might have an adverse effect for you given my track record! Hey Jeff... GO TRIBE!!!! Tee hee.. 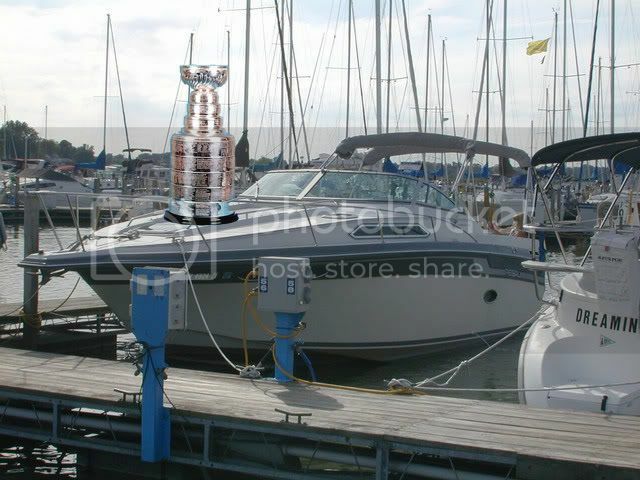 Exactly Coach, just promise me that you will let me drink from the cup, and I will drive my boat down to meet you. Have you been out on the boat much? did you get the I/O's or the inboards? 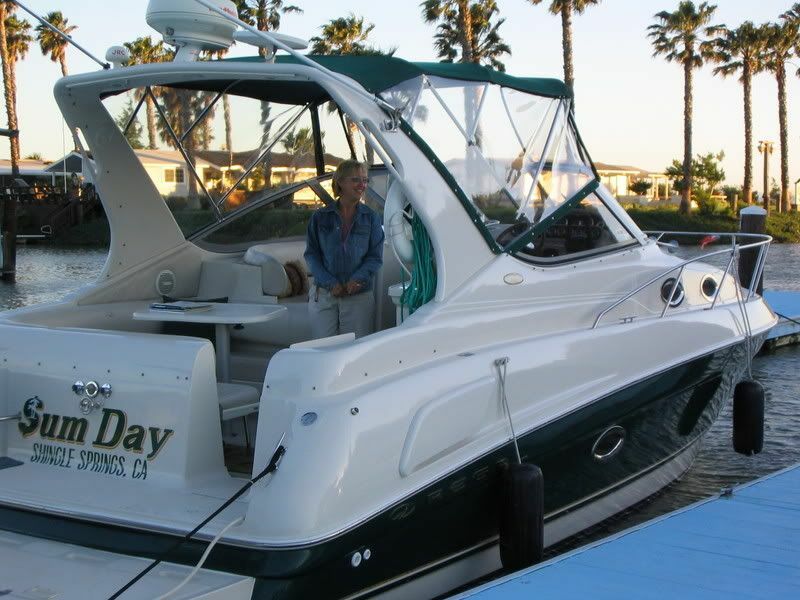 In any case, enjoy the boat it is great. DogDaze, maybe it was the stanley cup that busted my window??? (inside joke/long story). Well, it is finally fixed! Ends up Regal ordered the wrong one and that's why it took so long. If you can't beat 'em, join 'em. We wanted something bigger...I realized that if we win the cup, the 3760 has a little more room to show it off. Still looking to get over to Buffalo to looks at Rich's 322 before he pulls it for the season..
Glad to see you made it back! Now why is it that you have the same boat as me now??? Are you trying to be like this Red Wing fan??? Great choice in boat and good luck with the upcoming season. As always, I wish you and the sharks the best of luck until you run into the RedWings! Separately - DogDaze, I curse you and your Indiansrb2rb2@gr5tgr5t!